Eric Marsh, operations manager for Connell Resources, and Colorado Department of Transportation project manager Debbie McLain work on a preliminary survey for highway improvements on U.S. Highway 40 that were done in 2014. Also: People interested specifically in the U.S. 40 project can register for CDOT’s text updates by going to www.coloradodot.info and clicking on the green cell phone icon in the upper right hand corner of the page. By filling out a personal profile and providing a password, they can customize the project updates they will receive by project name. Note: U.S. Highway 40 in Steamboat Springs was not yet listed as one of the options as of Monday night. 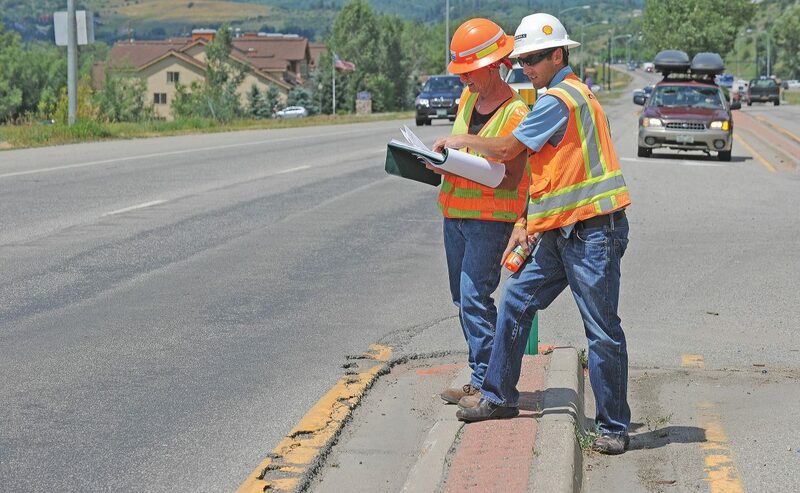 City of Steamboat Springs public works engineer Ben Beall said Monday night the city is folding a federal grant it obtained to improve pedestrian safety at one of the most dangerous intersections in town into this summer’s CDOT project on U.S. Highway 40. “The whole point is to improve the safety,” Beall said of the planned work at the highway intersection with Pine Grove Road, where commuters, bound for grocery and discount stores and the hospital, often stack up in the left-turn lane. "The city qualified for a hazard elimination grant after a pedestrian fatality in 2009 and it’s 100 percent funded,” Beall said. The funds will be turned over to CDOT for execution of the project. The stacking lane for vehicles will be extended and additional signage will be installed, Beall said. CDOT resident engineer Clint Moyer said part of the complicated redesign of the intersection will eliminate a high-speed right turn onto Pine Grove for westbound motorists on U.S. 40 along with elimination of a small concrete island in order to make the intersection revert to traditional right-angle turns. Also: People interested specifically in the U.S. 40 project can register for CDOT’s text updates by going to http://www.coloradodot.info and clicking on the green cell phone icon in the upper right hand corner of the page. By filling out a personal profile and providing a password, they can customize the project updates they will receive by project name. Note: U.S. Highway 40 in Steamboat Springs was not yet listed as one of the options as of Monday night. “The city qualified for a hazard elimination grant after a pedestrian fatality in 2009 and it’s 100 percent funded,” Beall said. Steamboat Springs — Steamboat motorists who thought traffic was a little nutty during Hot Air Balloon Rodeo weekend are in for an awakening July 28 when crews from Connell Resources, working for the Colorado Department of Transportation, begin a major paving project on U.S. Highway 40, which will be combined with the rebuilding of intersections, replacement of curbs and gutters and even a thorough inspection of the highway deck at the Mount Werner Road interchange. The work is all wrapped up in a $5.8 million project that won’t be completed until Dec. 5. The only section of U.S. 40 through the city that will be spared from the 7 a.m.-to-7 p.m. construction schedule is in the downtown from 13th to Third streets, which were repaved with concrete in 2010. Otherwise, work will begin simultaneously on the west and east sides of town, where motorists can expect that traffic will be reduced to one lane in each direction, from Elk River Road to 13th Street, and from Third Street all the way out to Walton Creek Road. CDOT’s traffic counts for U.S. 40 in the summer underline why the construction will have a big impact. CDOT’s project engineer Debbie McClain confirmed average daily trips in the vicinity of Walton Creek Road can range from 5,900 to 21,000. On the west side of town, ADTs from 13th to Elk River Road are about 14,000. Steamboat Springs Transit manager Jonathan Flint acknowledged that bus schedules will be disrupted, and because there isn’t much his staff can do about it, his expectation is that people who use SST buses to get to work will quickly adapt to leaving home earlier. That may be a strategy that many motorists also choose. Others may bicycle along alternate routes. Clint Moyer, resident CDOT engineer in Craig, said every intersection along the highway will be rebuilt with ADA-compliant pedestrian ramps, and a lot of traffic signal work will take place as well. Segments of curb that have been battered by truck traffic and snowplows over the years will be replaced to improve drainage. And attention will be given to improving a stretch of highway close to the fire station on the south side of town where in late winter, sheets of water from melting snow pour across the pavement and turn into ice at night. Steamboat residents and the city’s visitors can expect the work to take place from 7 a.m. to 7 p.m., but the primary emphasis of the work, milling up old asphalt and replacing it, will take place from 7 p.m. to 7 a.m., so that traffic won’t be impacted by the long strings of trucks queuing up. Asphalt paving can’t be done in frigid weather. Motorists can expect the work on the west end of town to begin where the highway intersects with Elk River Road and move toward 13th Street. At the other end of Lincoln Avenue, work will begin near the Rabbit Ears Motel and continue south on eastbound U.S. 40 to Walton Creek Road. The good news is that Marsh cares a good deal about Steamboat. A 1998 graduate of Steamboat Springs High School, he is taking on his 14th CDOT project with the improvements to U.S. 40.